On 30 May the House of Representatives voted to halt federal prosecutions of medical cannabis users in states that have legalized the drug’s use with a doctor’s prescription, marking the first time a chamber of Congress has approved such a broad decriminalization. The 219-189 vote wasn’t even particularly close, signalling a dramatic change in Congress on the issue of cannabis. Backers said the vote is a nudge to federal prosecutors that it’s time to move past the issue. House lawmakers approved language ordering the federal Justice Department not to interfere in any way with states’ medicinal cannabis laws. The vote came as part of the debate on the annual spending bill for the Justice Department. The action still needs Senate approval to become law. Minnesota joined 21 other states, where cannabis is a legal medicine with a law that is one of the nation's most restrictive. Democratic Governor Mark Dayton signed legislation that sets up a medical cannabis program with tight controls over qualifying conditions and the way it is administered. People won't be able to smoke cannabis legally or access it in leaf form. The compromise bill upset some medical cannabis advocates, who say many people who need relief from their symptoms won't get it. But legislative backers say it is a positive first step that satisfied concerns of law enforcement and doctor groups. If all goes as planned, cannabis will be available in pill, oil and vapour form in mid-2015. Two manufacturing facilities and eight dispensaries will be permitted state-wide. Under the plan patients need to possess a physician's recommendation (or the recommendation from a nurse practitioner or a physician's assistant) and suffer from certain conditions including cancer that is causing severe or chronic pain, severe vomiting or wasting, seizures including epilepsy, glaucoma, multiple sclerosis and other disorders that cause severe muscle spasms, amyotrophic lateral sclerosis, HIV/AIDS, and Crohn's disease. The following 21 States and the District of Columbia (Washington DC) already allow the medical use of cannabis: Alaska, Arizona, California, Colorado, Connecticut, Delaware, Hawaii, Illinois, Maine, Massachusetts, Michigan, Montana, Nevada, New Hampshire, New Jersey, New Mexico, Oregon, Rhode Island, Vermont, and Washington. The natural cannabinoid cannabidiol (CBD) is able to control the symptoms of REM sleep behaviour disorder. This is the result of four cases investigated at the Department of Neuroscience and Behaviour of the Faculty of Medicine of Ribeirão Preto at the University of São Paulo, Brazil. REM sleep behaviour disorder is characterized by the loss of muscle atonia during REM sleep associated with nightmares and active behaviour during dreaming. Researchers described the effects of CBD in these symptoms in patients with Parkinson's disease. 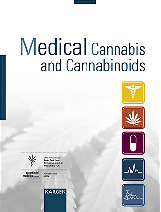 They found that four patients treated with CBD had prompt and substantial reduction in the frequency of REM sleep behaviour disorder related events without side effects. Rapid eye movement (REM) sleep is a stage of sleep characterized by the rapid and random movement of the eyes. Subjects' vividly recalled dreams mostly occur during REM sleep. Studies in mice demonstrate that the synthetic cannabinoids JWH-018 and JWH-073 elicit dose-dependent, CB1 receptor-mediated THC-like effects in mice when delivered via inhalation or via injection. Department of Pharmacology & Toxicology, College of Medicine, University of Arkansas for Medical Sciences, Little Rock, USA. 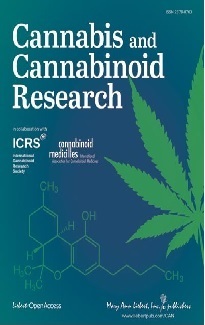 Scientists have prepared highly purified ajulemic acid using a different synthetic method than previously reported in the literature and compared its cannabinoid receptor binding constants with those obtained using several other preparations. Whereas CB2 receptor binding did not vary greatly among all of the samples, the CB1 receptor binding showed a wide range of affinities. The highly purified product (JBT-101) reported here had the weakest affinity for the CB1 receptor. Corbus Pharmaceuticals, Inc., Cambridge, USA. Results of studies with rats indicate that THC reduces methamphetamine-induced brain damage through CB1-dependent and independent mechanisms. Department of Biomedical Sciences, University of Cagliari, Italy. Castelli MP, et al. PLoS One. 2014 May 20;9(5):e98079. A study with 170 people with a clinical high risk of psychosis revealed that low use of alcohol, but neither cannabis use nor tobacco use at baseline contributed to the prediction of later development of psychosis. Hotchkiss Brain Institute, Department of Psychiatry, University of Calgary, Canada. In animal studies reduction of CB2 receptors in the kidneys worsens kidney disease in diabetes.